Roto EPS features Hikari’s Exclusive Ergonomic Positioning System and has a patented EPS Stabilizer that provides added support, creating comfort and stability. The patent pending EPS Rotator rotates 70 degrees. This allows effortless positioning, stability, and control at multiple cutting angles. Available in 6.0" and 6.4". A great scissor for those that prefer a slender, lightweight blade design. Offset handles with permanent finger rest have slightly smaller finger holes, a great fit for medium to small hands. Available in 5.0" and 5.5". The GR-2 incorporates Hikari's patented Guide tip blade design that allows a stylist to cut with extreme precision. A very pointy guide tip enables the stylist to scoop and cut the hair very close to the skin and around the ears. However, the patented guide tip has a smooth inside edge which prevents the stylist from cutting the client or themselves. With a longer bottom blade, the Guide's patented tip leads the scissor blade for continuous cutting on a section of hair, giving the stylist awesome precision cutting results! 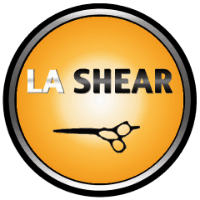 Other shears that have very little metal at the tips (very thin tips) can dull quickly and lack power at the tips. The slender and lightweight design makes it perfect for detail work. Available in 5.75". GR2 (THE GUIDE) - 5.75"
ROTO EPS R60 - 6.0"
ROTO EPS R64 - 6.4"
OFFSET HANDLES 126 - 5.0"
OFFSET HANDLES 201 - 5.5"